Malaysia is a beautiful Southeast Asian country — with rich culture and architecture, nature attractions, laid-back locals and cheap, delicious cuisine. 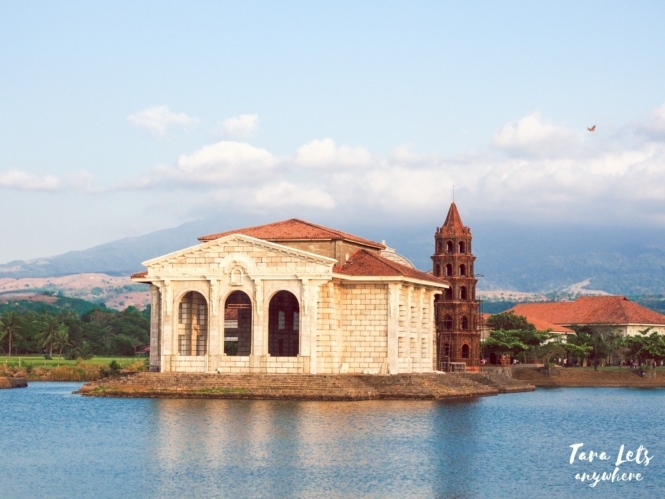 It doesn’t have the long list of attractions the Philippines offers, but what it lacks in numbers it makes up for authenticity. There’s a lot of things and experiences you’ll only get in this multi-ethnic country. 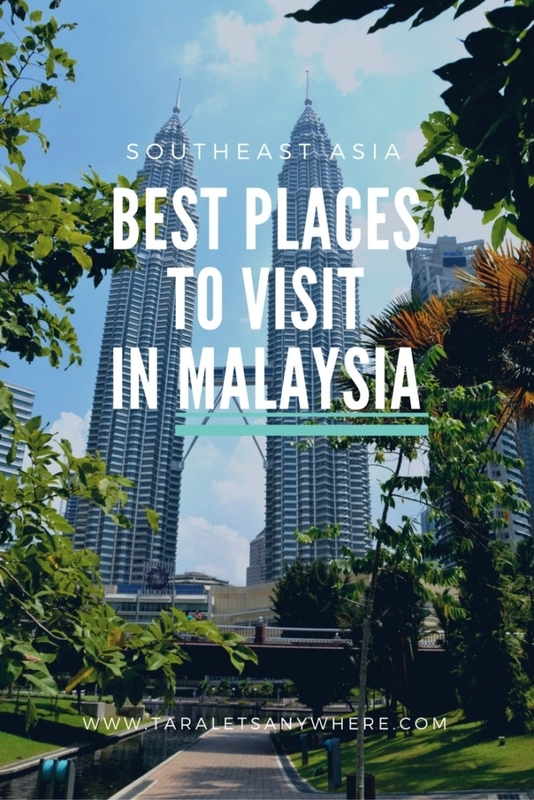 Here, we’ll show you the best places to visit in Malaysia, starting from its own very airport to farther north in Sabah. While other international airports boast of their indoor gardens, the Kuala Lumpur International Airport has an entire forest under its arsenal. Hiding among modern boutiques and F&B outlets near gates C-11 to C-17 and the Aerotrain station is the KLIA Jungle Boardwalk. It is recreational walk path located at the center core of the KLIA satellite terminal. The entrance can be a bit difficult locate but if you search around the glass and metal enclosures, you’ll find an tall rectangular opening with yellow chain curtains which is the access to the indoor rainforest. I have always been a fan of hiking, strolls in the park, and other nature trips which explains why the moment I was acquainted to this airport in a forest or forest in an airport, it instantly became my favorite airport to have long layovers at. If you’re going to Malaysia, chances are you’ll land in its capital Kuala Lumpur. Some people visit Kuala Lumpur as a layover, but it’s actually a city worth spending 2-3 days over. There’s a number of things to do in Kuala Lumpur: you can visit and go up the Petronas Towers, explore its nature parks (KLCC Park, Bird Park, etc), see old temples and shrines (Sri Maha Mariamman Temple, Thean Hou Temple, Batu Caves) and small town features (chinatowns, India Brickfields). Of course, a visit to Kuala Lumpur won’t be complete without food tripping. I suggest going to one of its night markets such as that in Jalan Alor to see the best of what Malaysian cuisine offers or at least try to dine in local noodle and mamak restaurants. The lush green highlands just a couple hours north of Kuala Lumpur are the perfect getaway from the bustling capital of Malaysia. There are direct buses from Kuala Lumpur to Cameron Highlands a couple times a day and only cost $10-$12 for the 4-6 hour trip. These buses follow the winding roads up into the mountains until they reach Tanah Rata. Get off here and enjoy this lovely mountain village and its cool temperatures. Definitely bring warm clothes as it can get as cold as 10 degrees celsius. The next day, start your adventure up to the viewpoint of Mt. Brinchang and wander through the endless green tea plantations. Don’t take a tour but ask for a hiking map at your hotel and get lost in the tea plantations, much more fun for sure! The locals are super nice and the food is delicious. Mind you, it rains a lot up here so bring a poncho! Georgetown is undoubtedly one of the most interesting and artistic cities in Southeast Asia. Dozens of murals line the city’s streets, giving it the feel of an open-air art gallery. Most of the works of art are concentrated around Love Lane, which is conveniently where many hostels and restaurants are located. This city is also one of the region’s great melting pots, influenced by Malaysian, Chinese, British and Indian cultures — and nowhere is this blending of cultures more apparent than in the street food. Georgetown has limitless options for grabbing a quick meal on the streets, which will broaden your culinary horizons and is also the cheapest way to eat. A trip to Georgetown wouldn’t be complete without a visit to nearby Penang Hill, easily reachable by public bus. The hill’s funicular railway takes you up to an elevation of 2300 feet, where the cooler air will be a welcome relief. The area is ringed with trails, and if you want to walk all the way back down, there’s even a path from the hill’s summit to the botanical gardens below. Whenever talk turns to Penang, it invariably turns into a conversation about Georgetown, which is not surprising due to its history and street art. But it’s the beach, resorts and night markets of Batu Ferringhi that have become our location of choice in this region. While you will find stunning luxury resorts on the beach like the Shangri-la Rasa Sayang, you can find somewhere to lay your head for any style and budget, and the beach is open to everyone. Watersports are plentiful, ranging from jet skis to parasailing, from kayaking to sailing, or just lay on the sand drinking cocktails if that’s more your speed. The daytime activities are great, but it’s the vibrant night markets that really make Batu Ferringhi stand out. Over 1 km of market stalls and restaurants come to life as the sun goes down. It is an explosion of color, activity and the incredible smells of Malaysian street food. After an evening of shopping, eating and probably downing a few quiet ales or cocktails, why not jump on one of the crazy rickshaws that ferry tourists up and down the streets? It’s a perfect way to get back to your hotel to get some rest before another full day of doing more of the same, because why would you want to do anything different? Malaysia is one of my favourite countries to visit in Asia, offering up such a diversity of experiences (and food!). One of my favorite places to visit is Kuching, the laid-back capital of Sarawak. Flying into the small city, the surroundings look so green. And that’s one of the attractions of Kuching: it’s a great base to explore the surrounding jungle and the culture of the native tribes of Borneo. From Kuching, it’s easy to head out on day trips to see the orangutans at Semenggoh Nature Reserve, to try and spot the proboscis monkeys and go hiking in Bako National Park or to visit the Sarawak Cultural Village at Damai Beach. Even better? If you’re on a budget, it’s possible to do all of these day trips utilizing the local buses for an extra cheap price. Have a free day? Visit the local Chinese temples, head to the Natural History Museum or explore the colorful street art and cat sculptures. At the end of the day, take a stroll along the river and then head for a relaxed meal and beer in one of the many cafes and bars. Perhentian Islands is a beautiful island and definitely one of the best places to visit in Malaysia, although it isn’t as popular (internationally) as other tourist attractions… yet. Perhentian Islands is composed of Perhentian Kecil (big island) and Perhentian Besar (small island). Most people go here to scuba dive. Perhentian Islands has beautiful dive spots, where you can see species of sea turtles and sharks. You can also get an Open Water Certification. Other than diving and snorkeling, you can also trek to discover local wildlife such as monkeys. If you prefer a more laid-back vacation, simply lounge under the sun or join a fire party in Bubu Long Beach. Seaventures is the world’s only rig dive resort and it also happens to be situated in Sipadan — routinely voted as one of the world’s best diving spots. The former exploratory dive rig has settled into its permanent spot and is now a fully functioning dive platform offering recreational diving and certification for advanced courses. Because Sipadan is now a protected site with limits on how many divers per day can enter, you are able to see a wide variety of sea life such as turtles, sharks, octopus, schools of fish and much more. When you’re staying on Seaventures you are also able to dive their house reef as much as you like, on top of the diving you arrange to do upon booking. Also, when I went, I had read reports that as great as the diving was, the food on board wasn’t very good. They must have changed this because when I was on board we were all impressed by not only the variety but the quality of the nightly dinners. Diving Seaventures is definitely a splurge money wise but years later, it’s still one of my favorite memories of Malaysia! For the best underwater views in all of Malaysia, Coral Island off the coast of the larger Tioman Island is by far the best spot! 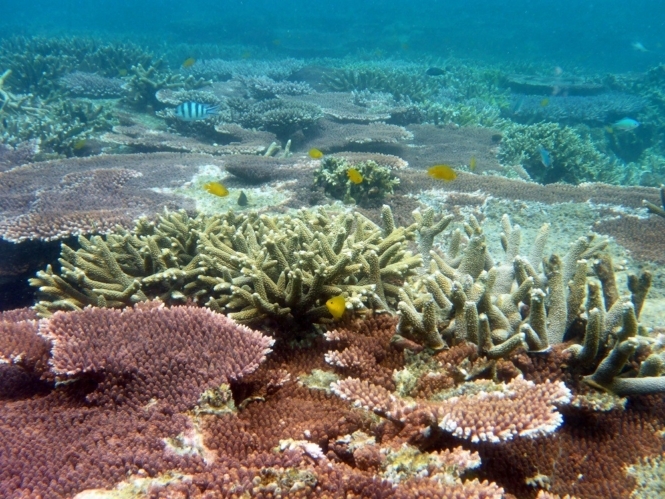 Coral Island is a very small, unpopulated island with corals that are in amazingly healthy shape. As a result, a crazy amount of fish populate the waters here. It’s an absolute sanctuary for clownfish, in particular. Countless anemones house these curious creatures, who are more than happy to swim right up into your face non-stop. Day trips from Tioman Island can be arranged for RM300 minimum base price for up to 4 people, RM350 for 5 people and up from there. The trip I went on lasted a good 6 hours, and the island itself is not more than 10-15 minutes away from Tioman. Boats leave from the Tekek Jetty, so if you are coming from any other part of the island, expect to pay for a taxi boat or a 4×4 over the mountain from Juara Beach. If you’re looking for a chance to get offline for a week, Kapas Island (Pulau Kapas) is for you. Located 4 km off the east coast of mainland Malaysia, wifi is very limited therefore you can spend time on the glorious beaches without a care in the world. When you’re not on the beach, you have lots of snorkeling options. With no roads or cars on the island, simply take a stroll along the various beaches until you find your snorkeling spot of the day. The best part about Kapas Island is they haven’t gone all out on the tourism (restaurants aren’t open all day). You won’t find 100’s of jet skis lined up waiting for tourists, no banana boats pulling people that have had one too many cocktails around the ocean and there is one bar on the island. People wake up early here and max out the relaxation time during daylight. Malaysia is full of amazing places to visit, but my favorite place is the island of Langkawi. We found flights for $20 from Kuala Lumpur and jumped on them for the chance to visit this gorgeous island in the Andaman Sea. Langkawi is one of the more popular island destinations in Malaysia that is frequented by locals and tourists alike. It is an island paradise with luxury hotels, gorgeous beaches and many activities to participate in. One of my top experiences in Langkawi was definitely going on a mangrove boat tour in the UNESCO-listed Kilim Karst Geoforest Park. The tour takes participants on an adventure through the tall, lush mangroves that is filled with wildlife. It stops at bat caves, passes capuchin monkeys, sneaks up on snakes and glides past feeding eagles. All this is before entering the azure Andaman ocean where everyone gets to explore one of the many islands that litter the area. The tour is fascinating, thought-provoking and left me with a feeling of eco-friendly humbleness. 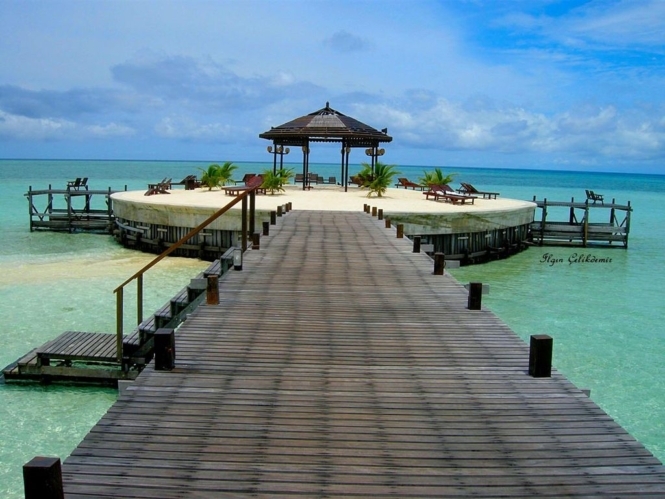 Port Dickson is perfect for people looking for a Malaysian destination to relax, especially if you have ever wanted to stay in an over water chalet for a very reasonable price. Port Dickson is located just a short drive from KL airport on the coast of Malaysia. The attractions are low key. There is a military museum, ostrich farm, temples and okay beaches. You can day trip to Kuala Lumpur from here. However, the reason we keep going back to Port Dickson isn’t the attractions. It’s the resorts. Port Dickson has some fabulous resorts for fabulous prices and its proximity to KL airport makes it perfect for a stopover. There are some great resorts for over-water chalets. Some of them even have private pools right on top of the water. It’s the perfect location if you want an easy break. One of our favourite places we visited in Malaysia was the Kinabatangan River, located in the Sabah region of East Malaysia on Borneo island. 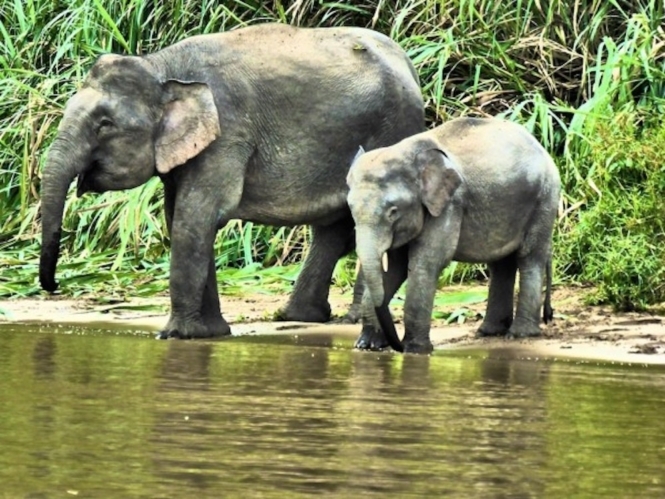 It is a popular destination to experience the rainforest and see incredible animals in their natural habitat, in particular orangutans, pygmy elephants, proboscis monkeys and many more. Prior to our visit, we saw orphaned orangutans at the Sepilok Orang Utan Rehabilitation Centre. Here at the Kinabatangan River we got lucky and saw a few orang utans in the wild, swinging from tree to tree. Another highlight was taking a boat ride along the river and watching the wildlife going about their daily activities. We got close up to a herd of elephants who were bathing by the river banks and saw many different types of monkeys preening themselves, hunting, chasing each other – generally being very cheeky. Getting up close to these magnificent animals was definitely a massive highlight for us from our trip in Malaysia. Mount Kinabalu. Photo by Peripetus (Wikimedia). It will take you another flight from Kuala Lumpur to visit Kota Kinabalu in Sabah, but this is one place that definitely shouldn’t be missed. Most backpackers visit Kota Kinabalu to conquer Mount Kinabalu, considered a World Heritage Site and the third highest mountain in Southeast Asia. Definitely not for the faint hearted, this one is reserved for the experienced mountain climbers. In addition, tourists can also go visit Mari-Mari cultural village to get to know the ethnic communities in Sabah. 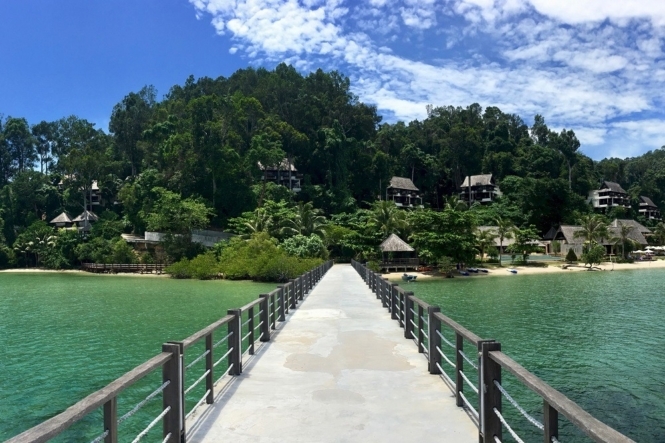 Lastly, you can explore the Tunku Abdul Rahman National Park, which is composed of five islands (Gaya Island, Sapi Island, Manukan Island, Mamutik Island and Sulug Island). The islands range from commercial tourist hubs to underdeveloped ones. Here you can enjoy white sand and turquoise waters, as well as snorkeling and diving activities. Gaya island lies in the Tunku Abdul Rahman Park and is usually not covered under the standard island hoping trips. Just a 15-minute speedboat trip from Kota Kinabalu, the capital of Malaysia’s easternmost state of Sabah (where one should not miss the night market at the harbor front for some great and cheap food), you can enjoy some of the best snorkeling spots in the country, take a boat trip along the coast or visit the Marine Ecology Research center to get more info of the wildlife. Also, Gaya island might be free from the hordes of tourists, but one should be aware of the monkeys. Those who want to stay overnight should definitely check out the beautiful Gaya Island Resort with private villas built high up in the jungle. If you’re planning to visit Malaysia soon, you might want to read this helpful article on costs of traveling to Malaysia. What other places would you recommend in Malaysia? 🙂 We’d love to hear your thoughts! Wow! What a great resource you have here! I totally agree with Malaysia’s authenticity and the balance with their rich culture and modern architectures. Will definitely keep this post handy for our comeback visits to Malaysia. Never running out of places to explore and be amazed of! Kudos! Hey! I don’t know how I missed publishing of this post. I’ve been on a very long vacation and is just beginning to explore the internets again. Hahaha! But thank you for this long list of places to see and visit in Malaysia. Thanks for including our contribution! I already knew we’d only seen a small part of Malaysia, but now there are even more places I’d love to go! Oh how I miss Malaysia, especially Georgetown. I took my bestfriend there for her bday since we are both suckers for street art, and Penang has one of the coolest murals I’ve seen in Asia.